Titles in Barron's extensive Painless Series cover a wide range of subjects as they are taught on middle school and high school levels. These books are written for students who find the subjects unusually difficult and confusing--or in many cases, just plain boring. Barron's Painless Series authors' main goal is to clear up students' confusion and perk up their interest by emphasizing the intriguing and often exciting ways in which they can put each subject to practical use. Most of these books take a light-hearted approach to their subjects, often employing humor, and always presenting fun-learning exercises that include puzzles, games, and challenging "Brain Tickler" problems to solve. This title combines fundamentals of Spanish grammar and vocabulary with fascinating insights into Spanish culture. 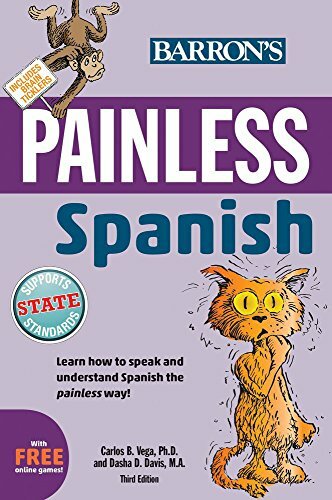 ATTENTION STUDENTS: You get a special FREE bonus when you purchase your copy of Barron's Painless Spanish Barron's is taking Painless to the next level: FUN! Sealed inside your copy of Painless Spanish, you'll find a code that gives you access to a FREE app. Simply key in that code on your iPhone, iTouch, iPad or Android device, and you download a fun-to-play Spanish language arcade game challenge that will reinforce your skill in reading, understanding, and speaking Spanish! Secondary school students who dread the idea of having to learn a second language are likely to change their minds when they open this book. Each of its 17 lessons teaches an important and interesting aspect of the Spanish culture while also presenting a lesson in Spanish vocabulary and grammar. All lessons have Spanish titles with English translations, followed by a brief passage written entirely in Spanish. Immediately following the short essay is a vocabulary list with English equivalents covering all key words in the essay. Brief exercises that follow cover grammar, more vocabulary, pronunciation, idioms, and cognates, words that are written alike in English and Spanish, but are pronounced differently. Written passages in English discuss various aspects of Spanish culture and history. 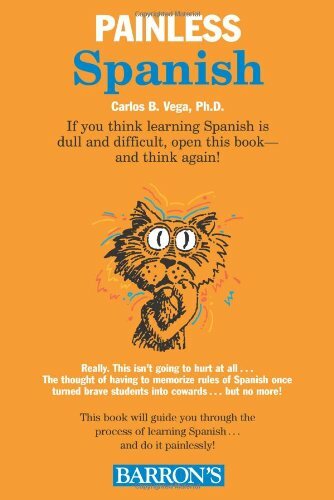 Structured in a workbook format, with exercises to test comprehension of the subject matter, "Painless Spanish" is a language immersion course, but with this important difference: it immerses students gently and painlessly into the Spanish language.